The Battle of Oriskany, fought on August 6, 1777, was one of the bloodiest battles in the American Revolutionary War and a significant engagement of the Saratoga campaign. Early in the siege of Fort Stanwix, an American relief force from the Mohawk Valley under General Nicholas Herkimer, numbering around 800 men of the Tryon County militia and a party of Oneida Indians, approached in an attempt to raise the siege. British commander Barry St. Leger authorized an intercept force consisting of a Hanau Jäger detachment, Sir John Johnson's King's Royal Regiment of New York, Native allies from the Six Nations, and Indian Department Rangers totaling at least 450 men. The Loyalist and Native force ambushed Herkimer's force in a small valley about six miles (10 km) east of Fort Stanwix. During the battle, Herkimer was mortally wounded. The battle cost the Patriots approximately 450 casualties, while the Loyalists and Natives lost approximately 150 dead and wounded. The apparent Loyalist success was tarnished when a sortie from Fort Stanwix sacked their camp, spoiling morale among the Indians. This was one the few battles in the war where almost all of the participants were North American: Loyalists and Native Americans fought against Patriots in the absence of British soldiers. For the Natives, the battle marked the beginning a civil war, as Oneidas under Colonel Louis allied with the American militia fought against members of the other Iroquois nations. On August 6, 1777, Herkimer halted his column moments before entering the fateful ravine. On August 5, 1777 Herkimer had sent a party to Fort Stanwix to notify Colonel Gansevoort of the approach of this militia and to request them to send a force from the fort to assist in the approach of the militia. When the militia had reached the ravine he had not yet received a response from the fort and proposed to wait until he received confirmation. (His messengers arrived at the fort at 11am). His Tryon County militia officers, however, interpreted Herkimer's hesitancy as cowardice and publicly rebuked him as a Tory spy. Faced with mutiny by his officers, Herkimer ordered the militia column to advance. The militia officers who followed General Herkimer into the ravine were Colonel Ebenezer Cox, Colonel Jacob Klock, Colonel Peter Bellinger and Colonel Frederick Visscher. 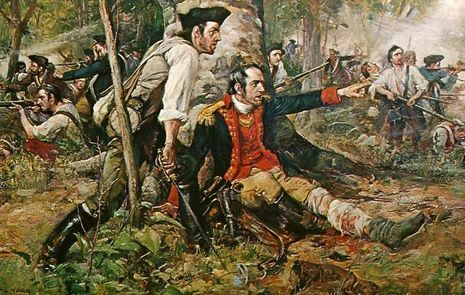 At 10am the militia entered the ravine and the discipline of the militia disintegrated. Exhausted from the heat of their march, many of General Herkimer's men broke ranks and ran to the stream for water. Although Sir John Johnson had instructed his Native American allies not to attack until all of Herkimer's militia had entered the ravine, the Natives could not resist such an opportunity. As the militiamen laid down their muskets and placed their heads to the water, the Native Americans attacked. In the opening volleys of the battle, General Nicholas Herkimer's horse was shot from beneath him, and he received a wound in the leg. Herkimer was carried by several of his officers to a beech tree now marked by a stone monument. Herkimer was urged by his militiamen to retire from further danger, but that he defiantly replied: "I will face the enemy." Historians interpret Herkimer's reply not only as a testament to his valor, but also his bitterness towards those officers who—having earlier branded Herkimer a coward for his caution and goaded him into the ravine—now urged him to retreat for his own safety. As the fighting continued, Herkimer rallied his men, fighting his way out of the ravine to the crest just west of it. Directing the battle while leaning against a beech tree there and smoking his pipe, Herkimer observed that the natives were watching the puffs of smoke from his militiaman's muskets. The natives exploited the delay caused by the need to reload muzzle-loading flint locks and rushed in and attack the militiamen with edged weapons--tomahawks and knives. During the battle, a violent thunderstorm caused a one-hour lull in the battle; Herkimer regrouped his militia on the higher ground. He instructed his men to fight in pairs: while one man fired and reloaded the other waited and then only fired if attacked. Firing in relays, both were to attempt to keep at least one weapon loaded at all times. This tactic served keep the Indians at bay to stabilize the remains of Herkimer's command. After the thunderstorm, a detachment of reinforcements from the King's Royal Yorkers arrived. These loyalists turned their coats inside out to disguise themselves as a relief party coming up the valley from Fort Stanwix. One patriot militiaman, Captain Jacob Gardinier, however, recognized the face of a Loyalist neighbor. In the confusion, the King's Royal Yorkers succeeded in investing the militia's position, but as casualties mounted, they withdrew. At about 2pm the garrison of Fort Stanwix sortied from the fort to sack the British and Native camp. The Native forces withdrew from the action with cries of "Oonah, oonah! ", the Seneca signal to retire. The tactics used by the patriots seriously delayed St. Leger's plans to surge through the Mohawk Valley and unite with Burgoyne and Howe. Upon the withdrawal of the Natives and Loyalists, the Patriots who had not fled the scene attended to the evacuation of wounded, some of whom were taken by boat downriver to safety. Many wounded Patriots were left on the field. The dead were not buried for several years. According to historical accounts, an hour into the battle, the creek ran red with the blood of the fallen; hence, the Battle of Oriskany was more commonly termed the Battle of Bloody Creek by local inhabitants in the decades that followed. The battle is known in British records as Herkimer's engagement out of respect for the American general's sacrifice and victory. The Indians tortured and ate some of their prisoners. Sayenqueraghta, the principal was chief, proposed to continue the fighting by pursuing the Colonials down river to German Flatts, but St. Leger turned their proposal down. This battle marked the beginning of the civil war in the Iroquois confederacy. Brant's Mohawks burned the Oneida settlement of Oriske, while the Oneida's plundered Tiononderoge and Canajoharie. The Fort Hunter Mohawks were later subject to the same treatment. This caused most of the remaining Mohawks to flee to Canada. The wounded Brigadier General Nicholas Herkimer was carried by his men from the battlefield. His leg was amputated, but the operation went poorly and Nicholas Herkimer died August 16, 1777. Loyalist John Butler commanded an Indian detachment in the battle. Butler's participation in this British victory resulted in his promotion to Lieutenant Colonel and being given command of Butler's Rangers. Marinus Willett left the fort on August 9, 1777 and went to Albany to appeal for help. General Benedict Arnold was dispatched and arrived at Fort Dayton with 800 troops and recruited 400 more. On August 22, they marched on to Fort Stanwix. The British forces besieging the fort fled on hearing of the approach of Arnold's troops. The Indians were particularly reluctant to engage in another battle after their losses at the Battle of Oriskany. The British retreated through Lake Ontario to join up with Burgoyne, causing this prong of the Saratoga Campaign to collapse. Because of the small population of settlers in the Mohawk Valley, the patriot losses sustained at the Battle of Oriskany were almost overwhelming to the community. Some families lost all male members; hardly any family escaped unscathed. Furthermore, combatants often found themselves fighting relatives who happened to choose the opposing side. Germans, Indians and English died on both sides.